Love art deco and vintage ladies so was thrilled to find those stamps, the cat is stamped on a card after running stamp pads across it. 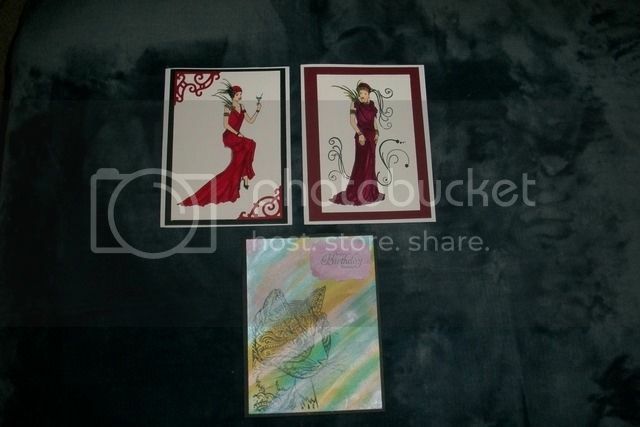 Love the vintage cards, Elayne. Very nicely done! Where did you find the 2 women stamps? The fist one looks like she's missing a bar stool and a bar. Is the black filigree drawn or stamped? This is all very nice work. Ha ha, I should have made the picture larger, she is sitting on a stool. The black filigree is a stamp I added. I found these two women on ebay, the stamps are by debbi moore, she has a few more that I might end up getting. Elayne, I love playing with my ink pads on paper to create background paper. I just did four sheets so that I could use them in my first flip book. I was all excited about the paper but after I placed it, I lost interest in the flip book. I ended up taking all the extra paper and making tags, which I also don't often, if ever, make.